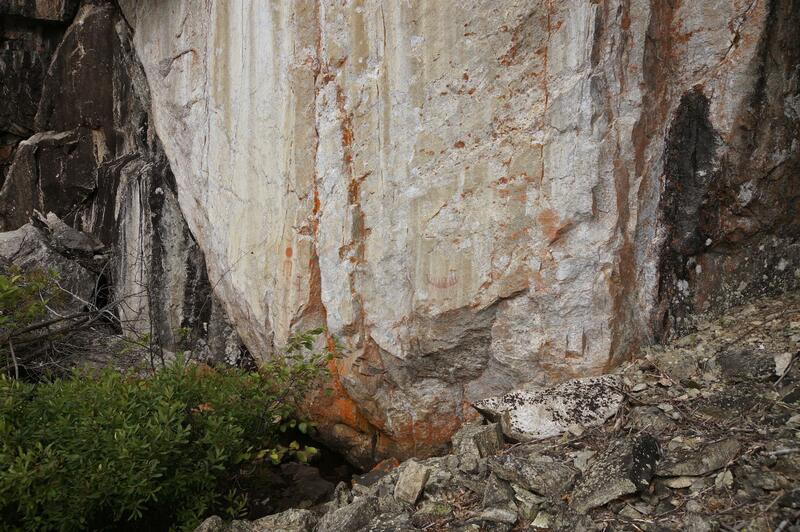 a small stretch of Cliff Lake’s many stunning vertical rock faces/ that’s my 6’5″ bro pointing his camera at me! The 1270-meter portage from Butland Lake done, we knew we were in for something special as soon as we paddled into the lake. Along the east shore was the first of many stretches of the vertical rock face that give this lake its name – Cliff Lake. 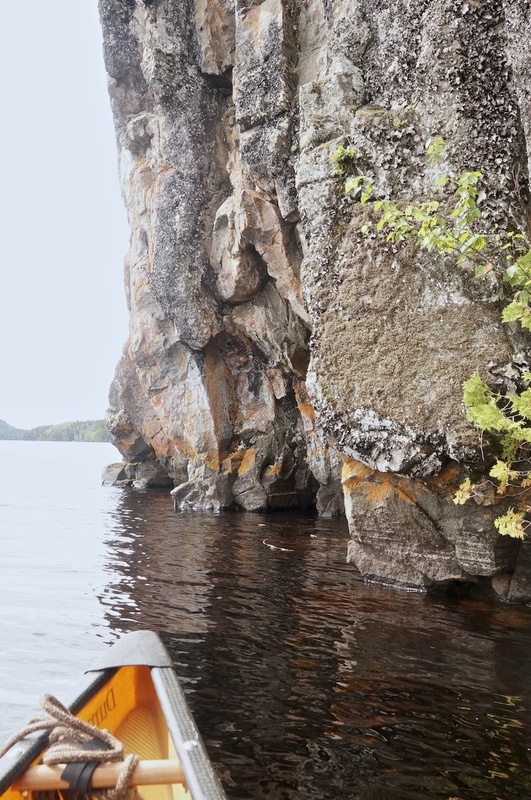 We would spend a few hours over the next day paddling kilometer after kilometer as close to the rock walls as we could. 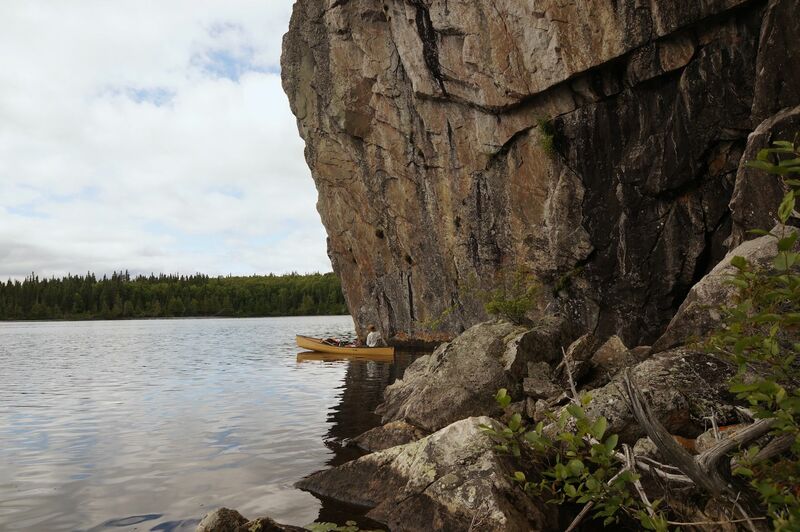 The rock face made us think of the previous summer’s paddle in the small lake on the Kopka River’s dramatic gorge section. There too we had marvelled at the energy the rock face seemed to exude. But at Cliff Lake, it was dialled up to a whole new remarkable level. The lake runs north/south and is about seven kilometers long. It is a part of the Pikitigushi River system, which has its headwaters just west of Butland Lake. Referred to as Mud River on older maps, the Pikitigushi flows south to Lake Nipigon. Even though the top part of the lake welcomes you with some eye-catching vertical rock, the real action starts a couple of kilometers further down. First, we set up camp on a small point on the east side of the lake. Then we paddled across to the first of the really dramatic cliffs (see the map below for the location). At the south end of this 250-meter section of the cliff face, we found the beginnings of a trail that took us up to the top. Sitting in the canoe or sitting on top – not a bad seat in the house! Cliff Lake and two excellent campsite locations as well as some other points of interest! …a concentration of petrographs that is exceeded only by the Hickson-Maribelli sites north of the Churchill River in Saskatchewan and by the Bon Echo sites on Lake Mazinaw in southeast Ontario. That puts Cliff Lake in remarkable company. On a personal note, what is also amazing (a better word might be “depressing”) is that I had never even heard of Cliff Lake or the other sites, for that matter, until I starting doing research on this year’s canoe trip route. First I read this thread (here) on the Canadian Canoe Routes website forum dealing with portages in the Cliff Lake area. 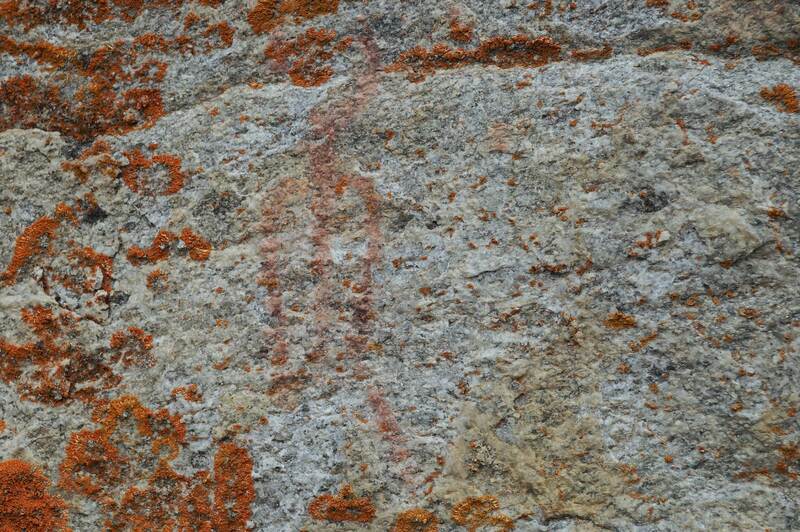 Then I stumbled into another thread (here) on pictograph locations in Wabakimi. I was getting very interested. To cap it off, I found Chuck Ryan’s (aka CIIcanoe) trip report detailing a route that we ended up making our own. 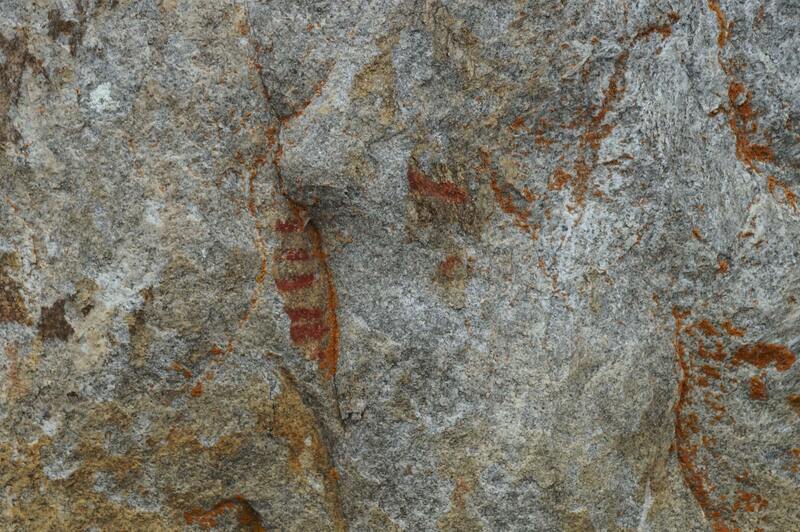 His post dealing with Cliff Lake (here) had some pix of the pictographs they had paddled by. 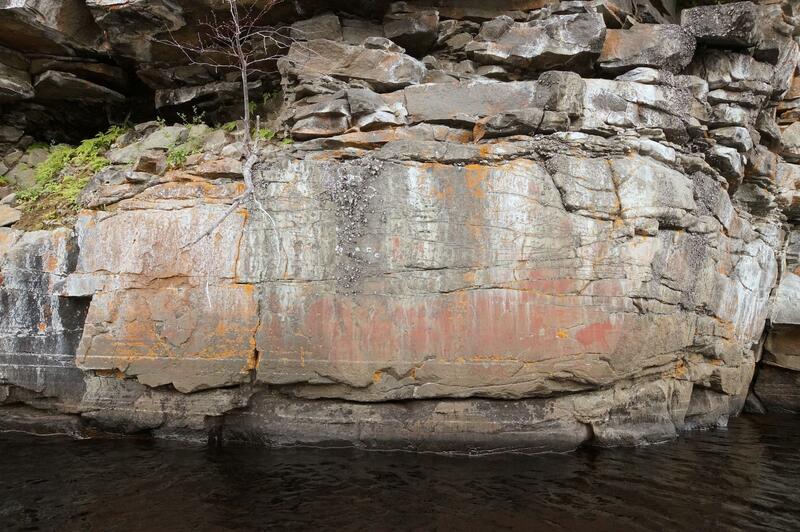 So there we were – four months later, paddling slowly down the lake, looking from the water line up about two meters or so for any sign of the ochre/fish oil substance that the Anishinaabe used to create their images on the rock. Given the trouble of finding the raw materials to make the “paint”, to think of the pictographs as simple graffiti is misreading them. Clearly, there was something on a higher level happening here. 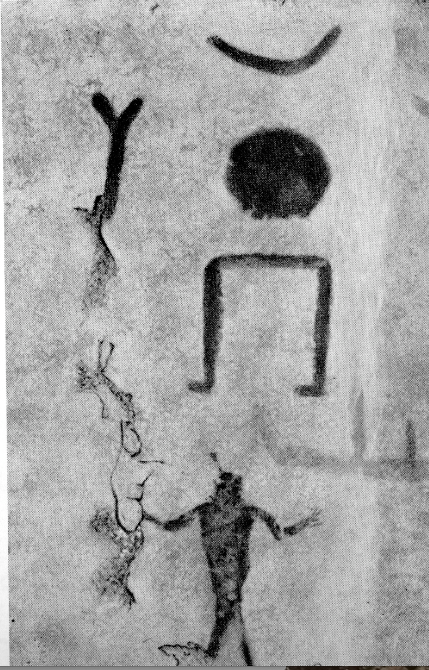 Explanations having to do with vision quests or the placating of spirits at the onset of some great venture or perhaps as an acknowledgment of a mission survived – these seem to be the best starting point for an understanding of the pictographs. The science-based and magic-free but hopefully still full-of-wonder frame of mind that I walk around with is not the same as that of a paleolithic hunter. While I live in a world without gods, his world is thoroughly infused with animistic elements to the point where supernatural and natural are the same. However, I can still recognize a fellow human as I paddle by and try to enter what remains of the painted images he took the time to create. 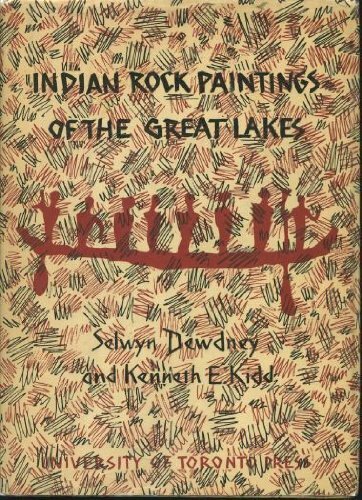 1. the already-mentioned Selwyn Dewdney and his book Indian Rock Paintings of the Great Lakes, whose first edition was published in 1962. In the second edition (1967) he added another 156 sites to the original 108, the result of another four years of following up leads. Most of Dewdney’s sites are located in Ontario and Manitoba and a few across the border in Minnesota. It is in the second edition that he includes the results of his two visits to Cliff Lake in 1965 and 1966. In 2014 the Royal Ontario Museum contributed a digital copy of the first edition to the Internet Archives Project. You can access it here. More recently the Toronto Library made available online a digital copy of the second edition. See here for the details. Finally, to make access even easier I ended up creating a pdf file of the material from the 1967 second edition. Download it here and scroll to pages 135 -141 for the Cliff Lake material. 2. 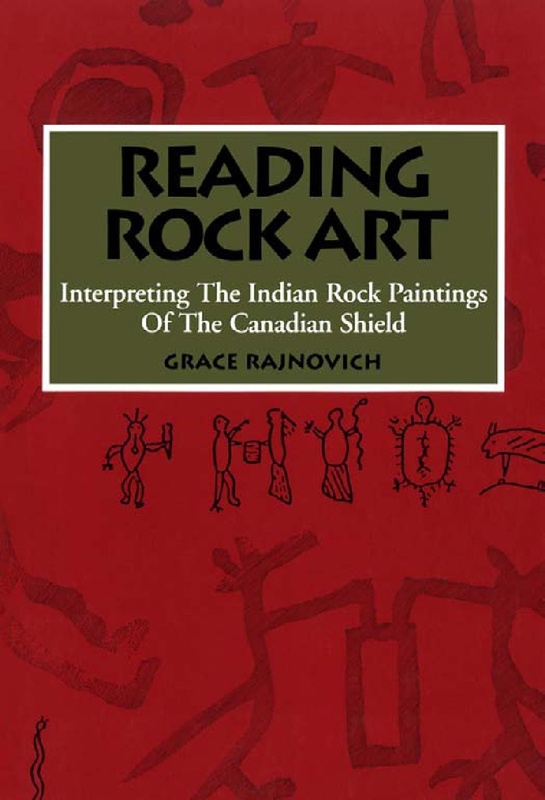 Grace Rajnovich in her 1994 study Reading Rock Art: Interpreting The Indian Rock Paintings Of The Canadian Shield delves into the meaning of the pictographs using the material from various surviving Ojibwe birchbark scrolls. Dewdney had also done work on the birchbark scrolls in the early 1970’s but never did unite the two in a more comprehensive study before he died in 1980. Rajnovich’s book is a must for anyone interested in the subject. Oddly enough, Cliff Lake is never mentioned in her book. Nor does she use a single Cliff Lake pictograph to illustrate a point she is making. Still, she provides a detailed thematic examination of a wide-ranging selection of pictographs. It can be ordered from Amazon in both print and ebook form! You can find some of the book’s content here – just enough to convince you that it would be a good investment! 3. 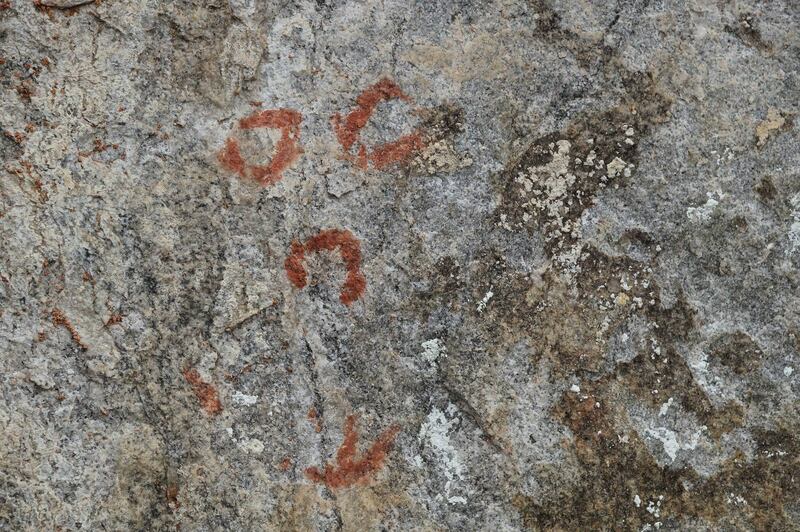 Thor and Julie Conway and any of a number of their articles and books but two in particular – a. a paper in Ontario Archaeology from the mid-1980’s on the pictographs on Temagami’s Obabika Lake. 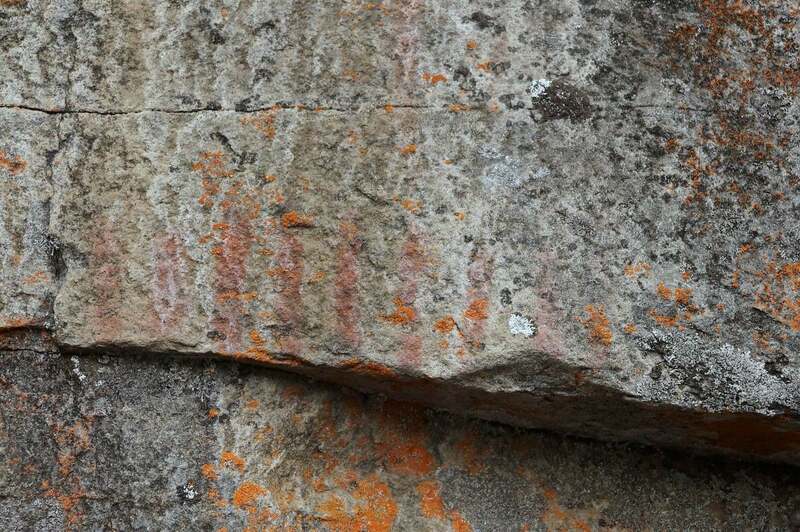 The full name is “An Ethno-Archaeological Study of Algonkian Rock Art in Northeastern Ontario, Canada”. It is available for download here. b.the 2010 second edition of Spirits on Stone, an expanded update of a book which was first published in 1990. 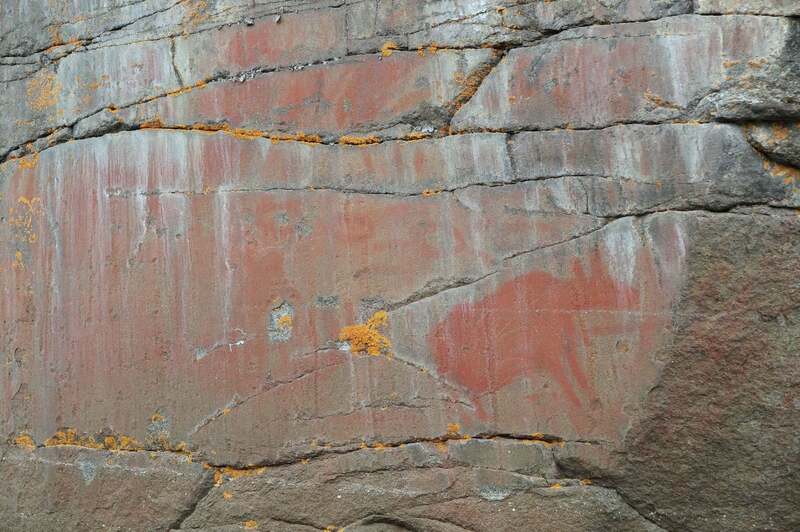 While focussed on the collection of pictographs at Agawa Rock, what he has to say can be applied to the images at other sites scattered across the Canadian Shield. Conway has a website here with contact information. I purchased the book directly from him. 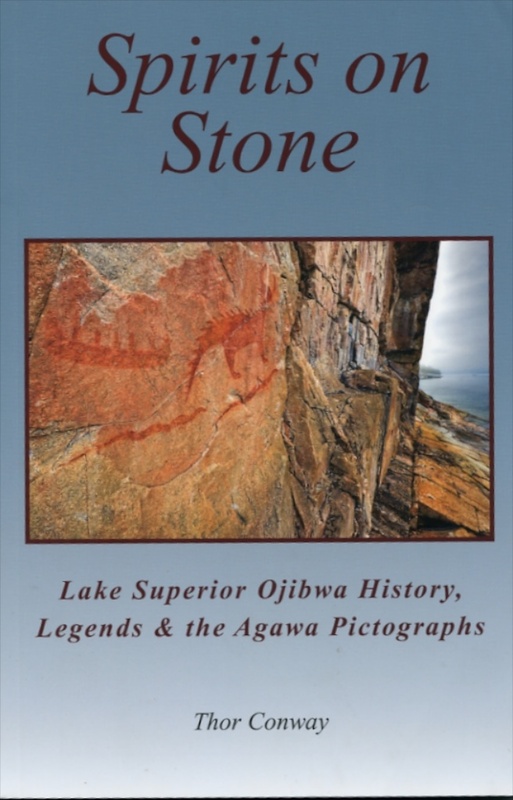 The Lake Superior Provincial Park interpretative center not far from Agawa Rock often has copies of the book available. It should also be noted that all three researchers show great sensitivity to and appreciation of the Anishinaabe elders who shared with them their knowledge of the traditional elements of their culture. The result is that their work probably reflects as accurately as possible the motivation of those who had painted their dreams on the rock faces a few hundred years ago. I am going to use Dewdney’s words and the sketches from the second edition of Indian Rock Paintings of the Great Lakes (pages 135 to 141) as the organizing principle. We’ll take a look at what Dewdney saw on his two visits to Cliff Lake and follow up with some additional pictographs not mentioned by him. 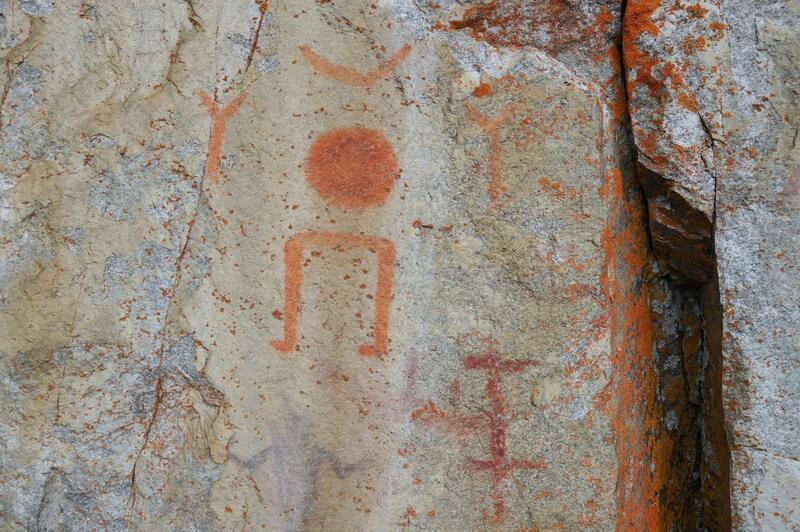 We begin with the pictographs which are in the best shape – they are the ones at the south end of the lake. 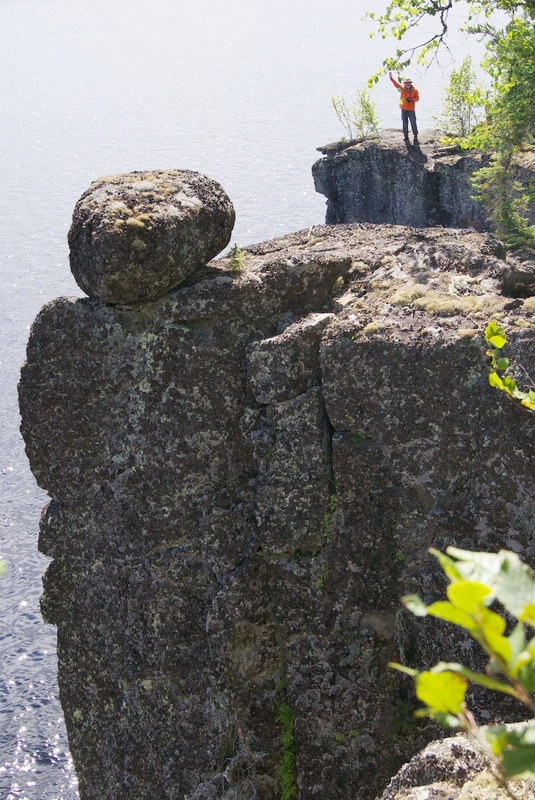 You’ll find them on the SE-facing rock face just across from the first of the portages to Bad Medicine Lake. 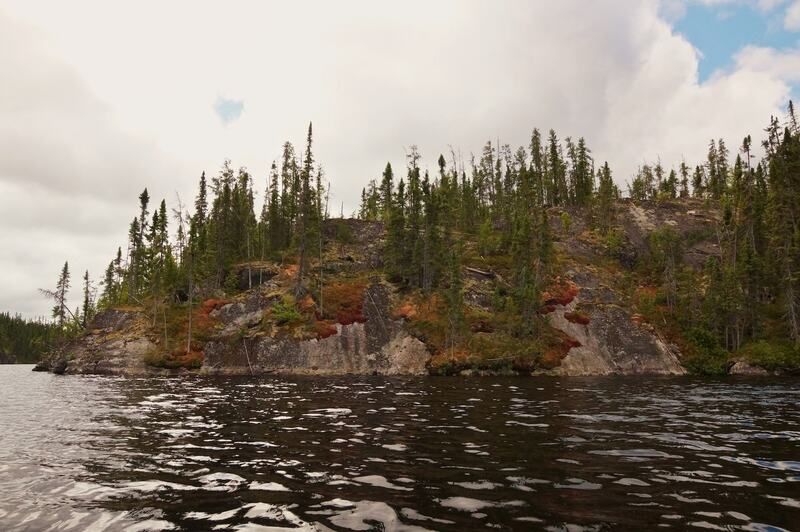 Dewdney describes it as “one of the few outcrops of granite on the lake”. When I first saw the Thunderbird I thought that it was a recent – i.e. in the past twenty years – addition to the other older ones. The ochre colour is stronger than that of most other pictographs we examined. However, look at this sketch by Dewdney from 1965 and you’d have to agree it is at least forty-eight years old! Yet weathering had taken its toll, too, on other paintings nearby, particularly the figure barely recognizable as human with its unusual centre line. Perhaps it is a different formulation of the ochre/fish oil “paint” which explains why some seem to age better than others? The two sites at the south end of the lake are the only ones where we could get out of the canoe and walk a few feet up to the rock face. 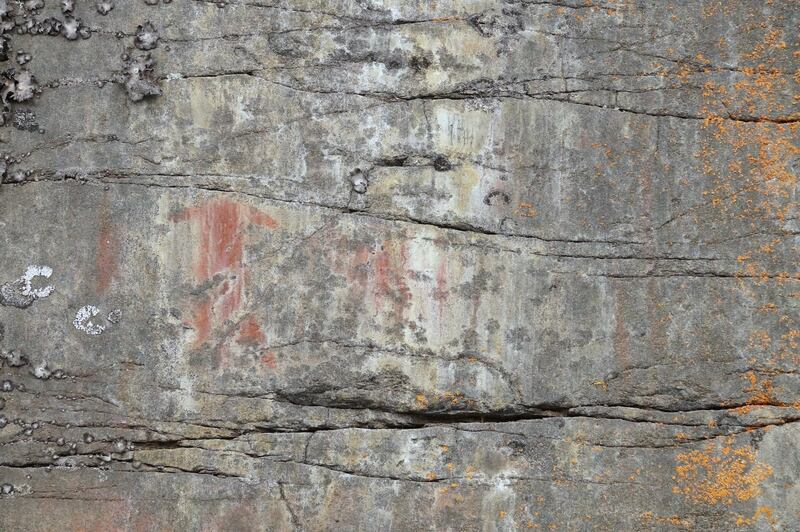 Here is another panel of pictographs not far from the one shown above – Dewdney identifies it as #262 in his book. Nowhere had I seen such contrasting styles within a small group, their separate origins emphasized by the distinct variations of pigment. The dreamlike ‘legs-that-walk-by-themselves’ and associated symbols in a bright orange ochre emphatically different from the ‘lone Indian’ in a dull ochre so impure that it cold only be described as dirty brown; and whereas the former was painted with course, finger-width lines, the latter showed detail, as in the fingers of one hand, so fine they at first escaped my notice. The ‘double-cross’ painted over the canoe also differed in colour, and the canoe was painted in a fourth hue of the ochre common to them all. Look closely at the above rock face (all photos enlarge with a click!) and you will see the canoe in the middle (the same one I used in close-up form at the start of the post) – look to the left of the canoe and you’ll see what Dewdney was pointing his camera at for the image two above this one. 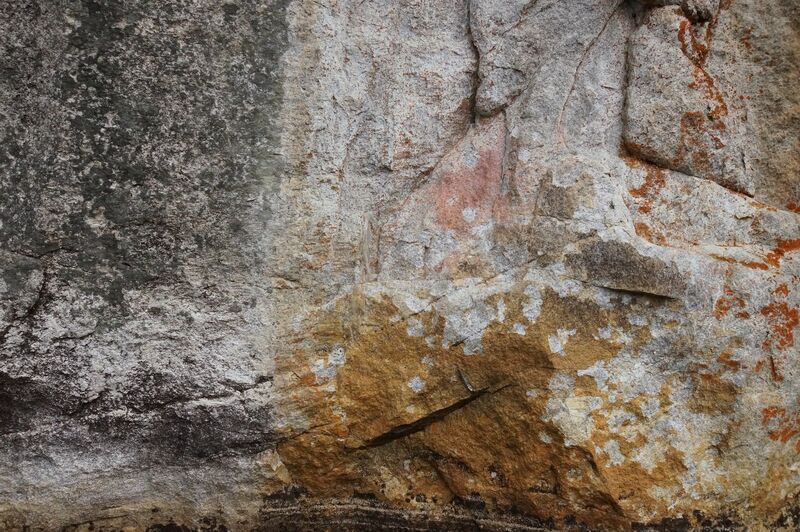 Here is a shot of the “horseshoes” and canoe pictographs with the surrounding rock. 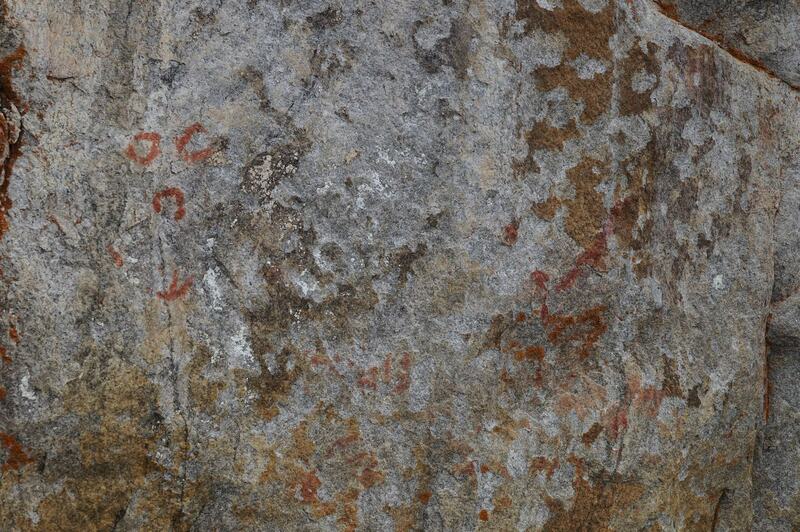 You can see evidence of other pictographs but they are indecipherable. We paddle in close and are able to discern images in the blurred ochre. Both III and VIII were smoothed by glaciation, but the former face seemed to have been grooved vertically by glacial action, which I still regard as impossible. With so little contrast we came back to work on it after the sun came out, only to find…that it threw the glacial grooving into relief and made the paintings almost invisible. 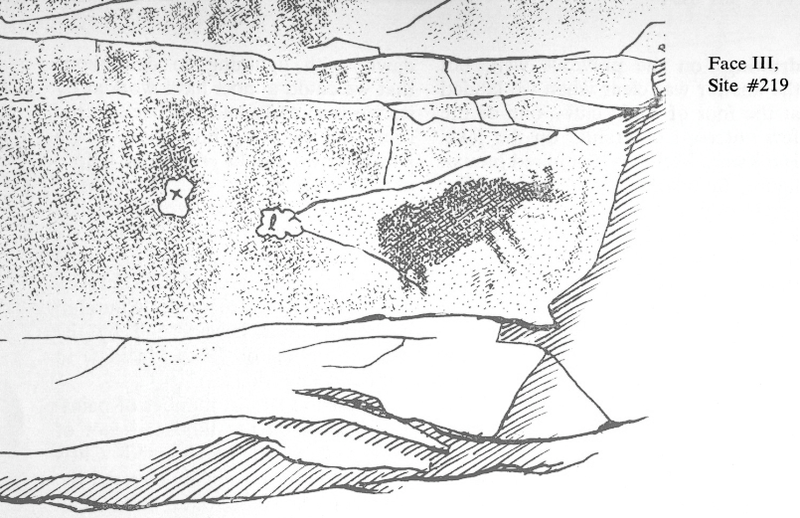 What does stand out the most is the animal image on the right – the very same pictograph that someone by the name of McInnes had made a drawing of some years before. 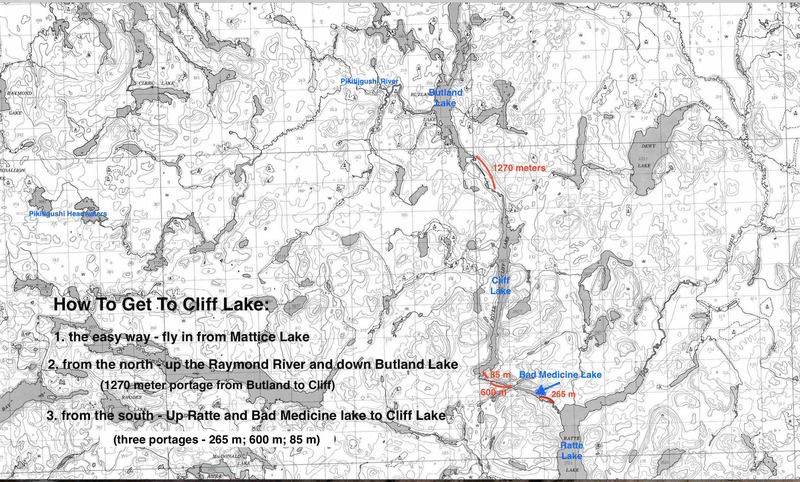 Dewdney had seen the drawing but had been unable to locate the pictograph even though McInnes noted that it was from Cliff Lake. 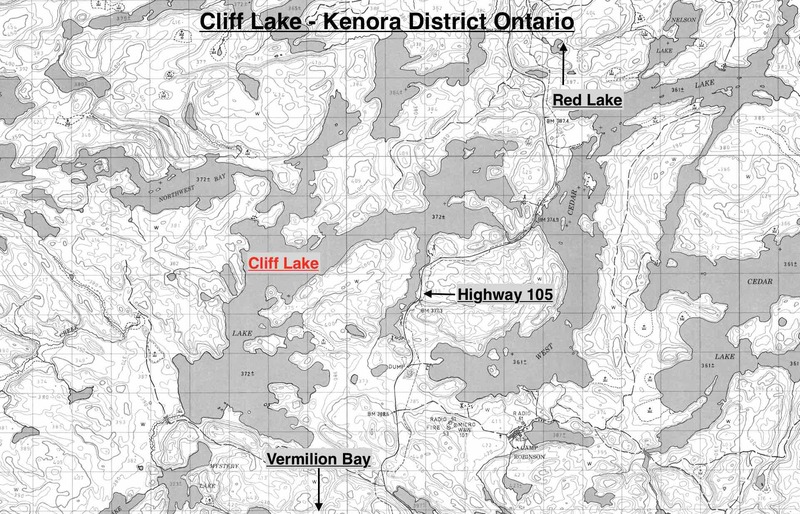 Kenora District’s Cliff lake – 330 km as the crow flies from the one in Thunder Bay District! 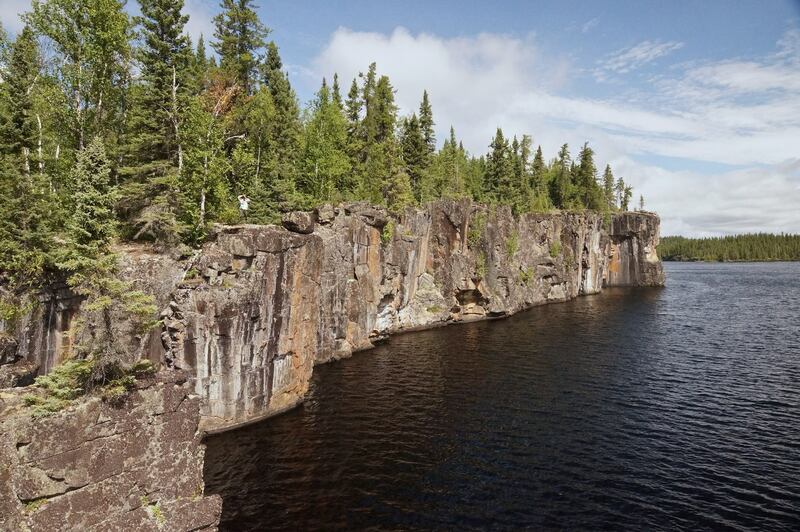 It turns out that there is more than one Cliff Lake in northwestern Ontario! Dewdney had originally looked for the source of McInnes’ drawing on a Cliff Lake near his childhood home in Kenora District. 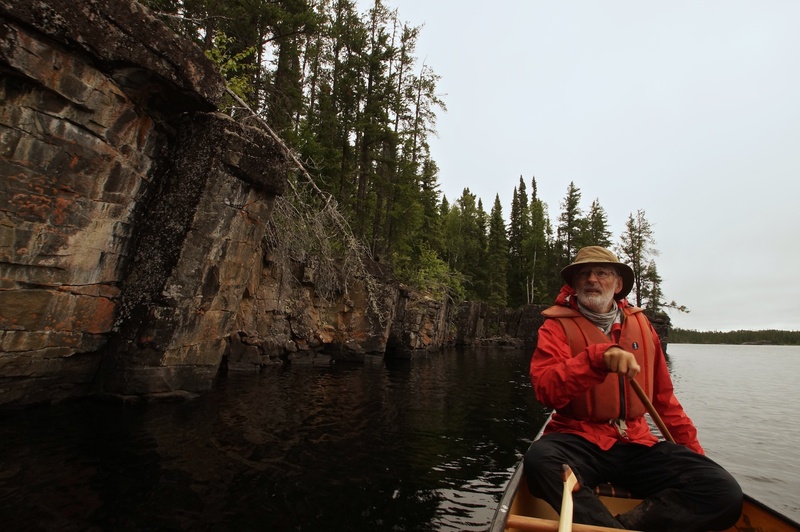 He noted somewhere that he must have paddled by thirty kilometers of shoreline on the Cliff Lake in Kenora District looking for that moose! Anishinaabe Pictograph Sites of The Canadian Shield. This entry was posted in Pictographs of the Canadian Shield, wilderness canoe tripping and tagged aboriginal rock art, Canadian Shield rock art, cliff lake pictographs, Cliff Lake rock paintings, Dewdney Canadian Shield rock art, Dewdney Cliff Lake pictographs, first nations rock painting, indian rock paintings, Ojibway pictographs, pikitigushi pictographs. Bookmark the permalink. 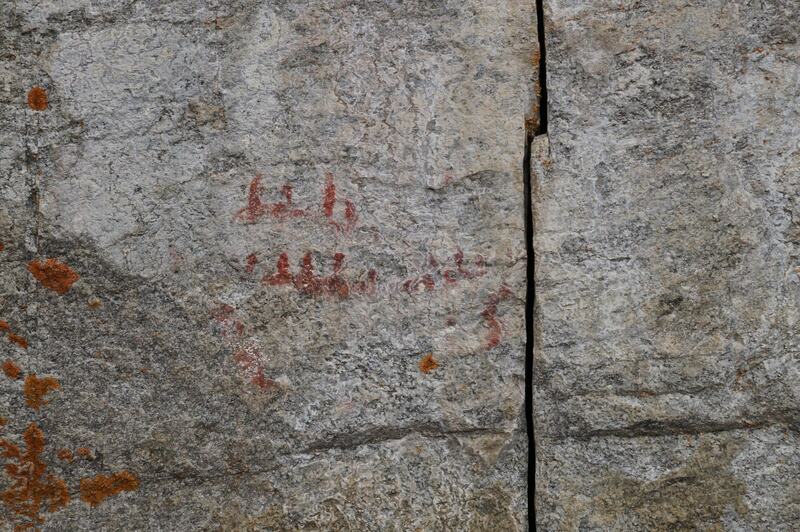 9 Responses to The Pictographs of Wabakimi’s Cliff Lake – Selwyn Dewdney Takes Us On A Tour! I really appreciate the picture of the Thunderbird from Cliff Lake. Anyone familiar with the constellation Aquila can quickly see how closely this pictograph matches the stars in the constellation. 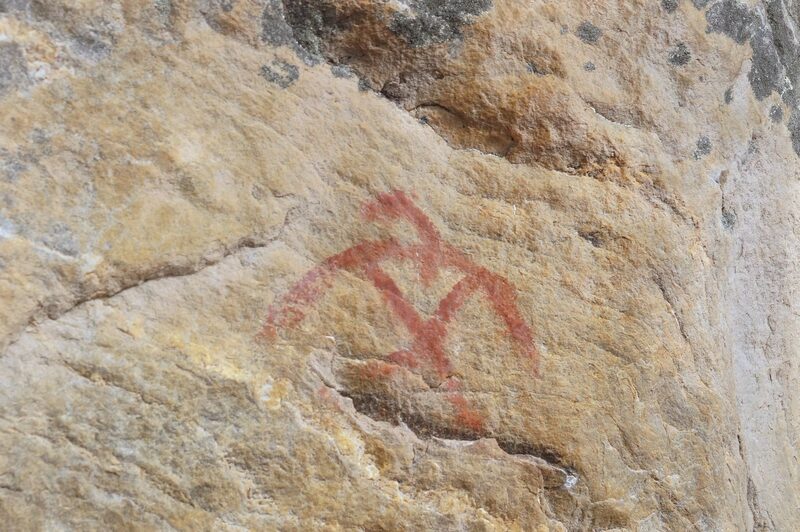 I also would like to comment on the pictograph of the Mishipeshu found at Agawa. The curved rear of the figure closely matches the curve of the stars in the constellation Perseus, and the constellation Cassiopeia would fit well in the position of the horns. I could send an image of these observations if I had an address to send a jpeg image. The human mind is incredible in its ability to create meaning and see pattern where there really isn’t any. Often it starts with the viewer’s particular obsession or immediate concern which he then projects onto the world at large. Co-incidence becomes intent. 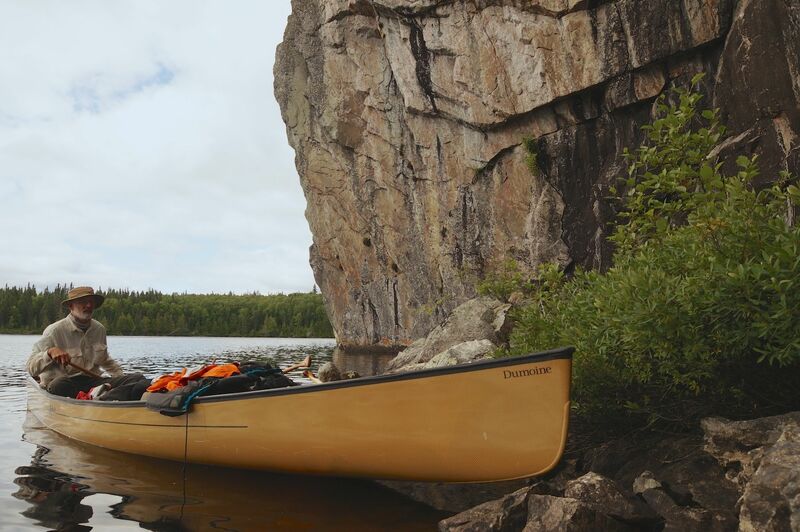 I’ve done it paddling – seeing a boat from afar which turned out to be a horizontal piece of birch on top of a darker piece of rock or seeing an portage marker in the distance which turns out to be a smattering of orange leaves. It helped that we were looking for a portage at the time! I think you’re doing it here. 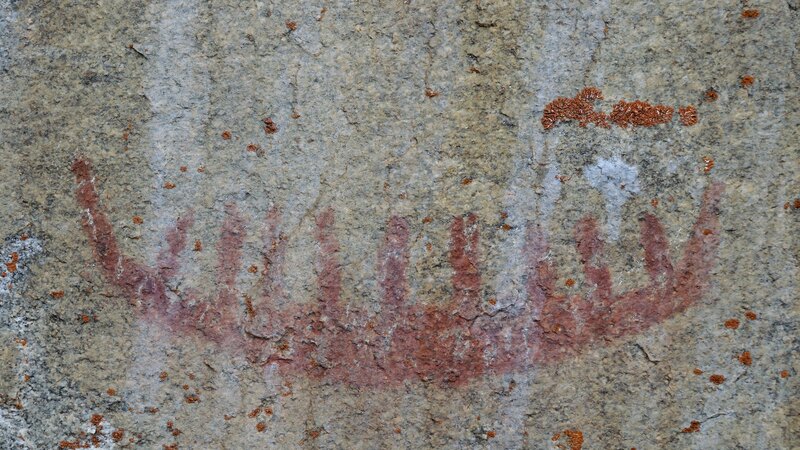 Nothing I have read of all the discussions that native elders had with people like Selwyn Dewdney and others they trusted about the meaning of the pictographs would lead me to connect them to what you see – i.e. representations of constellations. Perhaps you’ve taken your obvious interest in the stars and imposed it on someone else’s reality. Rather than project your own meaning onto the rock images, it is a much safer bet to begin with the people who drew them. To approach the images through their traditional mythology and understanding of the cosmos should provide a true reading of their meaning. That would be Anishinaabe peoples of the Canadian Shield like the Ojibwe (Chippewa). While I obviously don’t agree with your interpretation of the two pictographs, do send the jpgs to true_north@mac.com and I’ll post them for all to see. They should draw some interesting responses. These are comparisons between the pictographs and the star charts which I believe they represent. The Thunderbird, I think is unmistakable and has the extra attribute that it is a summer time constellation and therefore found at the time of the year when we have thunderstorms. The Mishipeshu is not as an exact fit as the Thunderbird, but very close in my mind and deserves some consideration as the inspiration of the pictograph. I would find it very odd that the constellations, which were very familiar to early people, would not find their way into pictographs at times. The pictographs on North Hegman lake in Minnesota, definitely depict stellar constellations for different seasons, and A few years ago I wrote an article about the stars of Hegman Lake and am also including it as an attachment. Check them out for any responses to his thesis. Two of us visited Cliff Lake this year, and fully enjoyed seeing the pictographs for ourselves. Appreciate the information that you share! Nice to hear you found the posts on Cliff Lake to be useful. In putting my pictograph posts together I end up learning more about the particular sites – and also just appreciating even more the privilege of being there. My bro and I were there in 2013. In two weeks we’ll be on the lake again for a second visit. We are going to spend a couple of nights there this time! One could probably spend an entire week on Cliff Lake and still have more to explore, as it really is a special site. We marked 18 different GPS locations of pictographs, and were too tired to do a walk up to the top of the cliffs, but from the water the sheer size of them is really impressive. How are you getting there this time? It was in early June (2018) that we did a 13 day route from Little Caribou via McKinley River to Best Island and Wendell Beckwith’s cabins, then down Ogoki River to Whitewater Lake, then finally up Raymond River and down Pikitigushi River spending a full day on Cliff Lake. Your route makes for an excellent intro to Wabakimi highlights! We also came to Cliff Lake after paddling up the Raymond River and doing the two Annette Lakes. The entire trip – we had started at Rockcliffe Lake on the Misehkow – still remains my bro’s favourite of all time! This time we are going plush! We are flying into Cliff Lake! 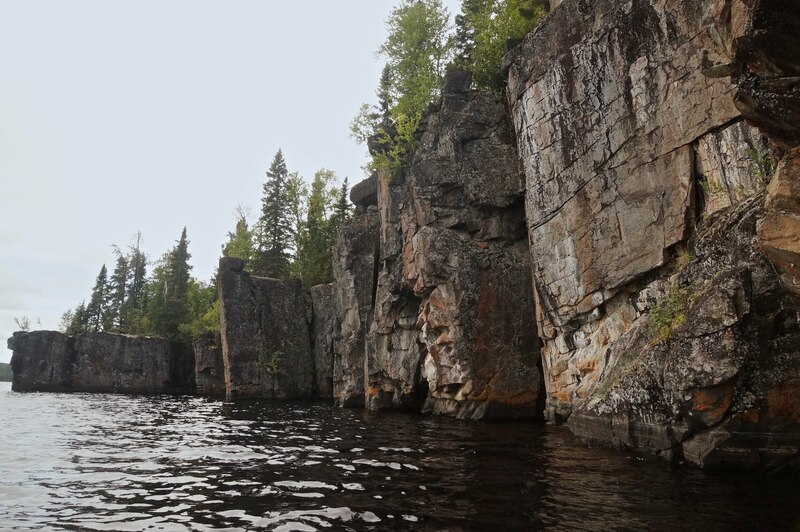 Then we’ll paddle down the length of the Pikitgushi right into Windigo Bay/Lake Nipigon. We’ve wanted to check out the river below the rapids at the logging road crossing for some time. Looks like some log jams to deal with! Then we’ll island hop our way from Windigo Bay down to Kelvin Island and paddle over to the mainland. Echo Rock is one spot we’re hoping to paddle by. I’ve heard people compare it to Gibraltar! Then there is a fire tower on Jackfish Island we’re hoping to walk up to for a scenic view! 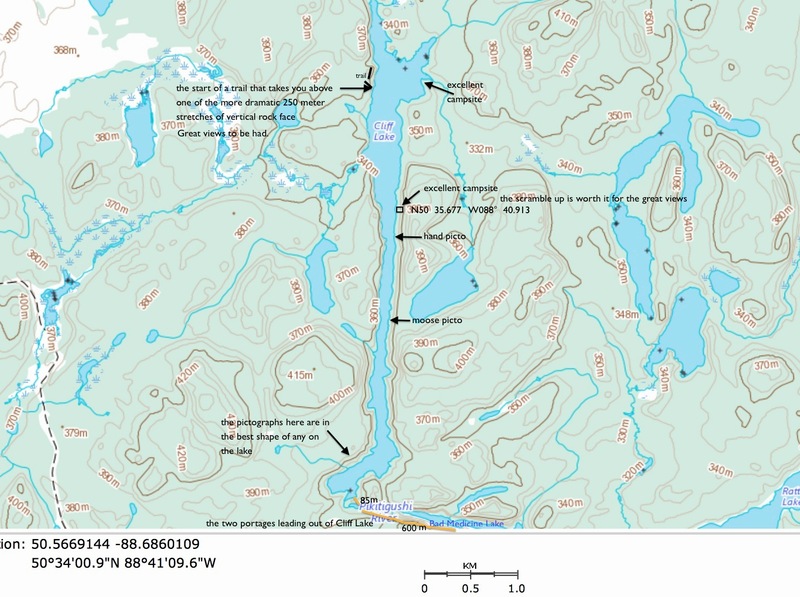 Finally north up to Wabinosh Bay and the mouth of the Kopka and either a return visit to the very scenic Lake above the Goat Portage or, if time is short, a paddle from Wabinosh Lake right back to our vehicle at Mattice Lake. We’ll see what the weather throws our way! I paddled with Peter Burkinshaw in Cliff Lake. A most inspiring amazing experience. As a not Canadian, I have appreciated all your blog posts and detailed explanations of your trip. Here is a link with pictures and comments to our trip on Cliff Lake. Enjoy your trip this summer with your Bro. Emmy, thanks for whetting my appetite! You uploaded a beautiful collection of images and useful comments and GPS co-ordinate​s for future paddlers. We’ll be flying into the lake in a few days! We had only a vague idea of what we’d see back in 2013 when we paddled into the lake​ from Butland to the north. This time we go with a different perspective!